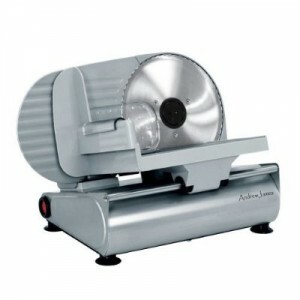 Andrew James food slicers are made to a high specification, perform fabulously well and they look great. Perfect for making your food go further and look better because every slice is the same thickness as the last. Wonderful for slicing roast beef, lamb, pork, chicken or turkey, whilst also being equally fabulous for slicing vegetables and salads. If you are a baker and you bake homemade bread then an Andrew James food slicer will make slicing your fresh homemade bread a dream! No thick doorstep one half and paper thin the other half slices of your homemade loaf. An Andrew James food slicer will without doubt make slicing easier and once you have one of these food slicers then you will wonder how you ever lived without one.